In this article I share something very nice which happened to me with Mr. Erre and Francesca. Mr. Erre and Francesca do not know each other and come from two different cities. Mr. Erre had a stroke or a CVA (cerebrovascular accident) and came to me with his wife to learn about at home rehabilitation some time ago, we have been working together for some time now, and a very pretty and productive atmosphere has been born. Francesca, on the other hand had the misfortune that her father suffered a CVA, and she also decided to learn the exercises for her father to be done at home, although he is still in the clinic. Now I will tell you how Mr. Erre and Francesca´s paths crossed. During the last consultation in my office with Mr. Erre and his wife, I thought that an excellent exercise for the recovery of his arm, could be the “exercise of the circles”. His sensitivity in the movement of his joints, (it is called kinesthetic). His attention with respect to the shoulder blade and the arm. The image of his arm in his brain (we will talk about that further on, right now just settle for, that the brain is represented in our body in motion). The control of the spasticity. The fluency, amplitude, and strength of the movement of his arm. I showed it and taught it to them, and when they got home, Mr. Erre and his wife who both have a good sense of creativity and practicality, prepared a ready to print model which makes the exercise of the circles even simpler to be done at home. Therefore, I sent Francesca the exercise drawn by Mr. Erre in order for her to do it with her father at home. The drawing is the one that you see below. I know it is a short story, but the fact is that the drawing made it easier for Francesca and her father to do the exercise at home, made a very pleasant action for me. So, I decided to share with you hoping that it would be useful. Let us continue with the explanation of the above mentioned exercise, for the recovery of the superior limb, consequence of a cerebral injury. Each person affected by a CVA or a cerebrovascular accident, is different than the others. I tell you this because each person requires that the exercise be designed “tailor made”, the samples, copy and paste, which I supply you, will later on have to be adapted to each individual case and further on, we will see how we can tell each other how to adapt the exercises to specific situations. I will give you an example; I will explain how to do the circles exercise sitting down, but if your loved one is still in bed and in no condition to stay sitting down, then you will have to find the way of doing it while he is lying down in bed, in fact, the basic instructions which you will read about doing the circles exercise, is only one of the many ways that you can do it. 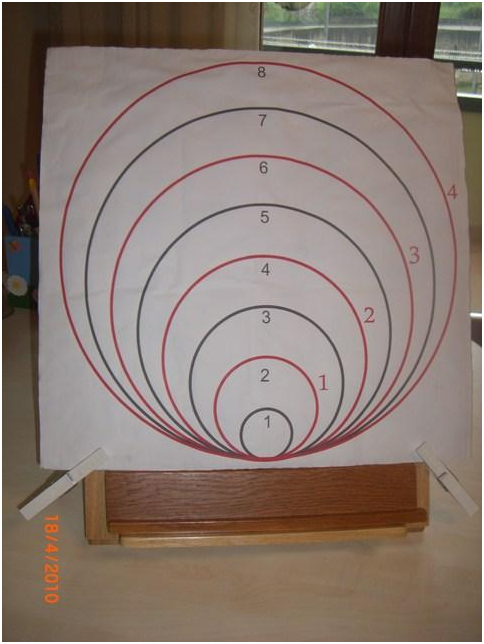 – Put the cardboard with the circles vertically on the table (Mr. Erre and his wife recommended a lectern or a music stand which they found on a supermarket for a few Euros, it is obvious that it is up to you how you place it, but the important thing is that they must stay in a vertical position. The therapist with one hand holds the patient´s hands (if at all possible open hand) while the other hand is placed below the elbow. Now that the patient´s arm is between the therapist´s hands, he can put the patient´s hand close to the base of the circles. The therapist will remind the patient, that in this first stage, he will only try to relax the arm, and that the movement will be done with the therapist´s help. The patient has his eyes closed while the therapist follows with his hand guiding the patient’s hand the path of a circle. After completing the circle, the therapist takes the hands off the circle and the patient now with his eyes open will try to identify the path of the circle just done indicating the number or in case of speech problems, pointing it out. At the beginning of the exercise, the patient’s arm could be “rigid” due to what we previously defined as spasticity, more precise one of its elements which is the abnormal reactivity to the stretching (abbreviated, R.a.a.s), and a law that a good therapist must always keep in mind, specially the part that you must never force the patient’s rigidity; because and you should remember, that it will be controlled by the patient himself on his own time, if our exercises are properly done. The exercise is too difficult and the patient does not pay adequate attention. The exercise is too simple, thus his attention is not stimulated enough. Control of the R.a.a.s., (generally this last point is more evident since it is easy to understand that if the arm or the leg are rigid, is because the muscles are “tense or stiff”, thus any attempt of movement activated by the patient, could only be qualitative elementary and little functional. Try the exercise and if you face difficulties, please write them down below, and we will reason them together and it will also be useful for the others, as Mr. Erre was for Francesca. I once again appreciate the attention you pay to my articles and I really hope that they are useful. In the coming articles, you will find an example of an exercise for the recovery of the spasticity and the movement of the hand.